So, what else makes us happy? Well, that depends on what makes you and your family unique. What’s your family’s story? Do your children and grandchildren know it? Traditional financial advisors are good at tackling the technical challenges, such as the legal and financial planning that families must address. A modern estate plan, however, is not all there is to consider when creating a legacy. After all, most family interactions are not technical discussions about taxes or investment returns – they are far more interesting than that! When is the last time you discussed the importance of community involvement, professional development, or shared family goals and expectations? What non-monetary goals are important for your loved ones to achieve in their lives? What values should their lives reflect? Philanthropy? Entrepreneurship? The arts? We frequently have clients who express their concerns about how loved ones would manage an inheritance, and those concerns are well-founded. Often, however, clients have not told the story of how she or he earned those resources. The story behind the assets is interesting, and extremely important to the choices that are made by succeeding generations. If assets become part of the “family legacy” instead of just money in an account, there is a higher likelihood that they will be used wisely. The story also becomes part of who the family members are, not just what is in their bank accounts. Telling the family story does not mean telling younger generations every last detail about your finances. Instead, it means dedicating time and attention to preparing family members for a future inheritance in a meaningful way, and doing that more than once. It also means sharing with younger generations the intellectual, social, human and spiritual responsibilities they will take on as future family leaders – and as beneficiaries. Mark Twain has been quoted as saying, “The difference between the right word and the almost right word is the difference between lightning and the lightning bug.” A singular focus on technical details without discussion about the larger family legacy can be detrimental to a family and a family’s wealth. We are inviting you to consider some of the less obvious, but incredibly important discussions and plans you may need to have with your family. 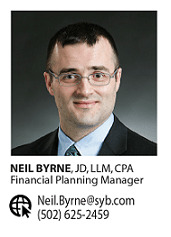 Please contact your advisor to talk more about your family’s legacy, or me at neil.byrne@syb.com or (502) 625-2459. See: https://www.futurity.org/money-can-buy-happiness-1685132/ “Money can buy happiness. Here’s how much it takes,” February 21, 2018. Never sign something you don’t understand. Consult with a financial advisor or attorney before signing any document that appears suspicious or unclear. Keep personal items out of plain sight. Lock up checkbooks, credit cards and other monetary instruments to prevent unauthorized use.Resource information provided by the American Bankers Association.